My jaw almost dropped when Ryan casually mentioned one day that he decided he wanted to bring a new breakfast to work. Ryan is a cereal lover and has been ever since I met him. Cereal for breakfast isn't enough for him. He often requests extra boxes from the store for "snacks". Perhaps you've heard me mention before that he likes to put peanut butter in his Reese's peanut butter puffs, along with milk, and go to town. Forget the cookies and other desserts always present in this house, he's perfectly content with cereal! While I doubt his after-work cereal consumption will decrease, I set out to find some new breakfast options for him. We don't have enough time in the mornings to make anything, so I needed something that he could grab and go. 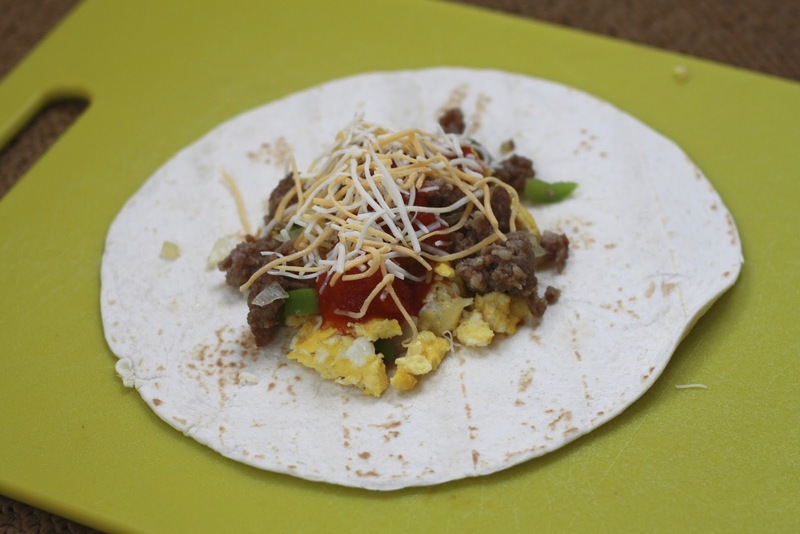 These breakfast burritos turned out to be just the thing! I took an hour or so one weekend to make a batch of 10, which lasted him two weeks. I stuffed mine with sausage, scrambled eggs, onion, green pepper, salsa, and cheese, but you could change up the filling. Rice, beans, or other vegetables would all work well in here! Unfortunately I don't have a picture of one hot from the microwave, but they've apparently been a hit--I've already been requested to make another batch! Hopefully my burrito folding skills will improve over time! Note--I wrapped the burritos in plastic wrap and then foil. I stored them in a freezer bag in the freezer. Ryan removed them as he needed them, unwrapped them, and wrapped one in a paper towel. He reheated in the microwave for about 2 minutes, until warmed through. 1. In a large skillet, cook pork sausage over medium heat, breaking up with a spatula or wooden spoon until cooked through. Remove sausage from skillet and set aside. 2. Add pepper and onion to the sausage skillet. Cook until softened. Add eggs (first crack eggs in a large bowl and whisk to break up the yolks) and cook over medium heat, stirring and flipping occasionally to "scramble". Season with salt and pepper. 3. Top a tortilla with a bit of the egg and veggie mixture, some sausage, a tbsp of salsa, and cheese. 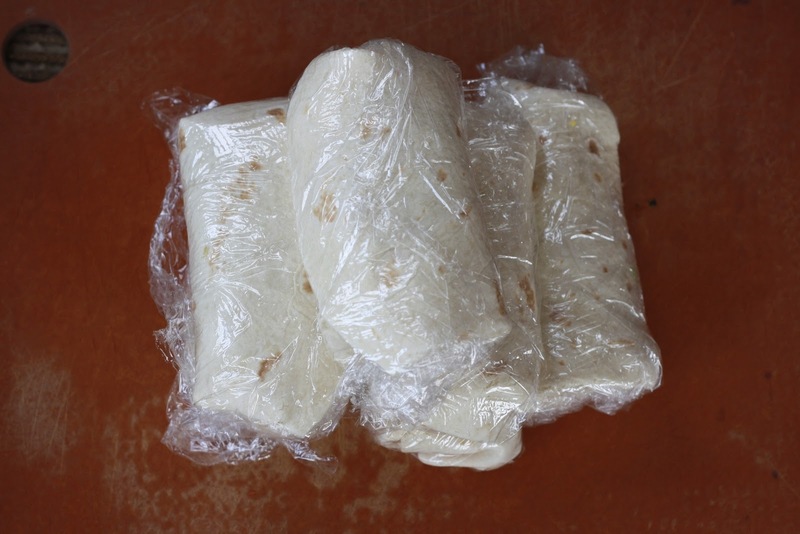 Fold burrito and wrap in plastic wrap and foil. Store in a freezer bag in the freezer. 4. To reheat, unwrap burrito from plastic wrap and foil. Wrap in a paper towel and cook for 2 minutes on high.